Within the SAharan Mineral dUst experiMent (SAMUM) a consortium of numerous European research institutes investigated the effect of Saharan dust on the climate system of the Earth's atmosphere. Detailled information are available on a separate Website. What are the local microphysical and chemical properties of Saharan dust? 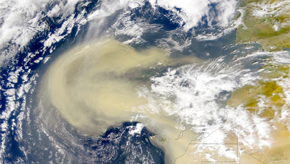 How does Saharan dust affect the properties of the Atmosphere? How das Saharan dust affect the regional and global radiative balance? SAMUM-I: Characterization of Saharan dust at its source. Therefore, a several week long measurement campaign was conducted iin Morocco in 2006. SAMUM-II: Characterization of Saharan dust after considerable long-range transport. In the frame of this investigation, several measurement campaigns where conducted at Cape Verde, about 2000 km away from the Saharan desert, in 2011.